This award was established by the family of Dr. Bruce M. Eberhart to honor exceptional students in the Biology Department who are academically excellent, actively involved in research, and demonstrate significant extracurricular contributions or service to the department, the university, the community as a whole, and even to fellow species they share the planet with. The award was established in 1997 to honor the memory and many contributions of Dr. Eberhart, a cancer victim, to the Biology Department and the community by honoring the students who are contributing to the department and the community in ways that were typical of him. The award is presented to graduating senior biology students and consists of a cash honorarium and a book, which is chosen to repersent contributions to science and humanity by outstanding individuals or biological scientists. This serves, then, as an inspiration to young biological scientists just starting in their careers. The Eberhart Award fund provides not only the cash honoraria but also scholarship support for undergraduate research. The book presented to the Eberhart Award winners in 2011 was The Immortal Life of Henrietta Lacks by Rebecca Skloot. From the book’s dustjacket we learn that, “Doctors took her cells without asking. Those cells never died. They launched a medical revolution and a multimillion-dollar industry. More than twenty years later her children found out.” The issues about medical and scientific ethics raised by this book are definitely what Dr. Eberhart would have been concerned about and thus this was the volume chosen for the award winners. 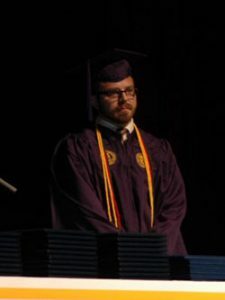 Andrew James Blank – is a member of the Beta Beta Beta national biology honor society and has worked in a pathology laboratory. He has been very active in research in the laboratory of Dr. Elizabeth Lacey, where he took a leadership role in the research she is conducting – contributing to the research questions, designing experiments and conducting them in an efficient manner. He has presented his work at the annual meeting of the North Carolina Academy of Sciences and received an award for his presentation. And, in-between, maintaining an excellent academic record to graduate with honors, actively pursuing research in one of the biology department laboratories, he has been able to volunteer his time at the Guilford County Animal Shelter. Chandra Ellen Metheny – represents the biology students who are concerned about, and provide service to, species other than their own. She is a tireless worker for sea turtle conservation, having volunteered at the Karen Beasley Sea Turtle Hospital on Topsail Island, NC. This spring she served as an intern at the Karen Beasley Hospital, putting in many more hours than those required of an intern. She has been instrumental in helping to support the Sea Turtle Conservation course of Mrs. Ann Somers, providing support to Mrs. Somers and fellow students for the activities of the course. She was very helpful in volunteering to provide support for the Biology Department Sustainability Symposium and she is also a member of Beta Beta Beta, the national biological honor society. 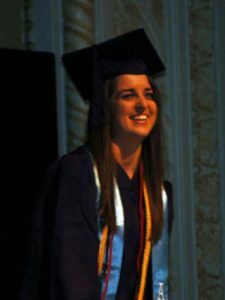 Danielle Elizabeth Mizerak – is secretary.of the UNCG chapter of the Beta Beta Beta national biology honor society and member of the Alpha Delta Pi sorority. Dr. Robert Stavn, who nominated her, was first introduced to her when asked to fill out a form, for the sorority, certifying her grade level and performance the Marine Biology class. He got the impression that this group of academically and service oriented young women meant business. They support Ronald McDonald House in Winston-Salem by preparing meals for families staying there, in addition to raising money on campus for it. She has tutored students in Biology at Smith High School in Greensboro. She has been a leader in the Supplemental Instructional Program at UNCG where students provide discussion groups, extra help, tutoring, etc, for students in what are judged to be large and difficult science courses. 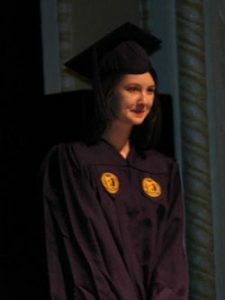 She has worked on research in Dr. Kirchoff’s lab and Dr. Schug’s Genetics lab and … was Homecoming Queen for 2009-2010!